Bloom: Once blooming; Beautiful, very mossed buds open into elegant clusters of crimson-red, old-fashioned, many petaled 3 1/2″ blooms (petals 40+). Profuse blooming. 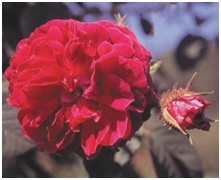 Interesting Facts: Rated as the second best of all old garden roses by the American Rose Society. Wonderful cut flowers.